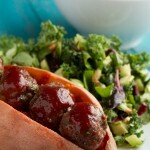 Oven-baked paleo meatball recipe with homemade dry garlic rib sauce added before baking. Preheat oven to 350F and line a baking sheet with parchment paper or silicon baking mat. Add meatball ingredients to a large bowl. Mash with your hands to combine. Pinch off a section of meat, about 1½ tablespoons, and roll between palms to form a ball. Place on the prepared baking sheet and repeat with remaining meat. This recipe will make 24 meatballs, 4 balls per serving. Bake meatballs in preheated oven for 20-22 minutes, or until internal temperature reaches 165F. Remove from the oven and let cool slightly. 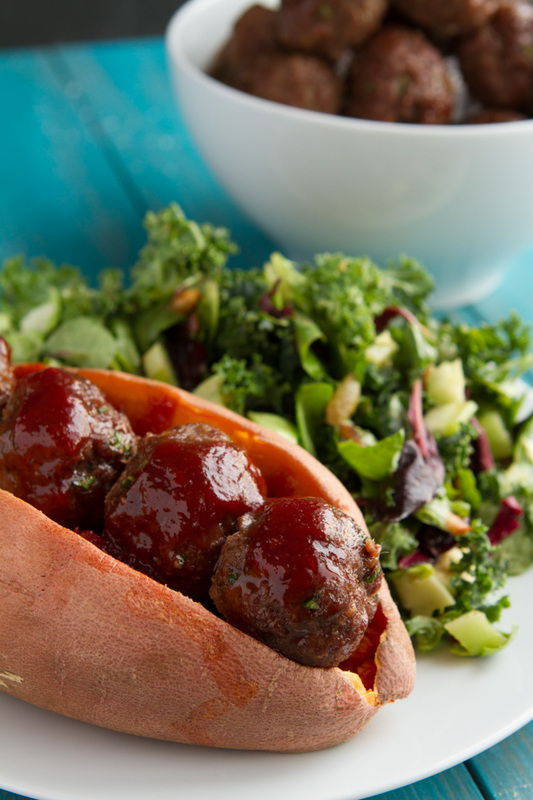 Then, cut sweet potatoes in half, lengthwise, and sandwich 4 meatballs between each “sub”. Drizzle with BBQ sauce and serve. Add to bowl with meat and extra things. Mix. Almond Flour: I tested this recipe without any flour or binder at all and it didn’t work. Something needs to be used to hold everything together. If you are NOT grain-free, you could use gluten-free breadcrumbs, quinoa flakes or perhaps oat bran. I have not tested these options. If you ARE grain-free, you could try finely-ground sunflower seeds or pumpkin seeds. Egg: I tested this recipe without eggs and it didn’t hold together as well as I would have liked. It still “worked” but was a bit sloppy.